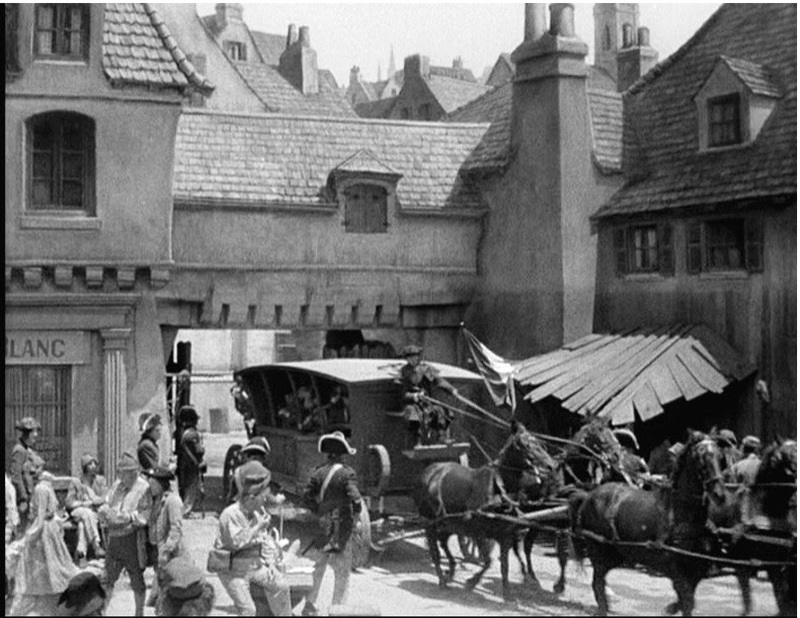 Hello friends and fellow aficionados of the lost artform of the traditional matte painter. This issue we will be taking a look at two of my favourite Golden Era Hollywood motion pictures that both fit the bill inasmuch as being top shelf prestige productions as well as each being beautiful examples of the matte painter's skill from an era long since passed. 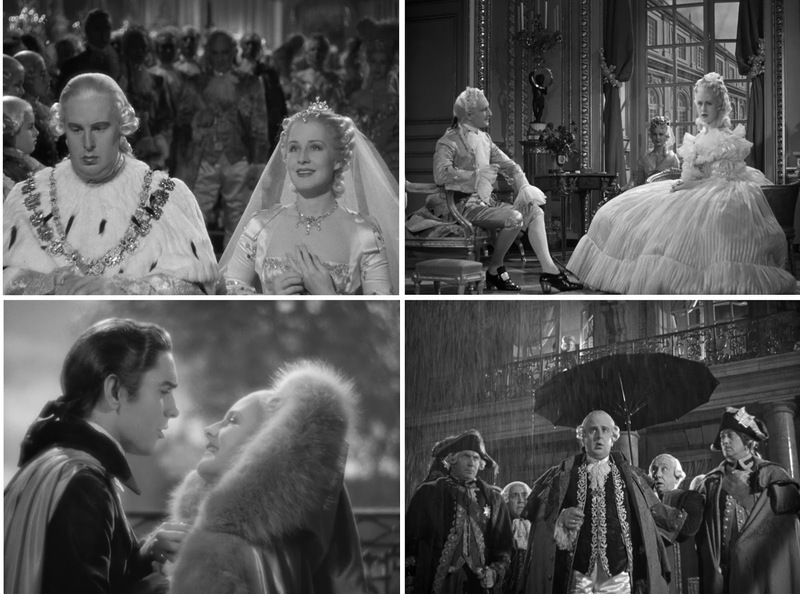 Both of today's films were important Metro Goldwyn Mayer pictures from the 1930's, MARIE ANTOINETTE made in 1938 and A TALE OF TWO CITIES made in 1935. 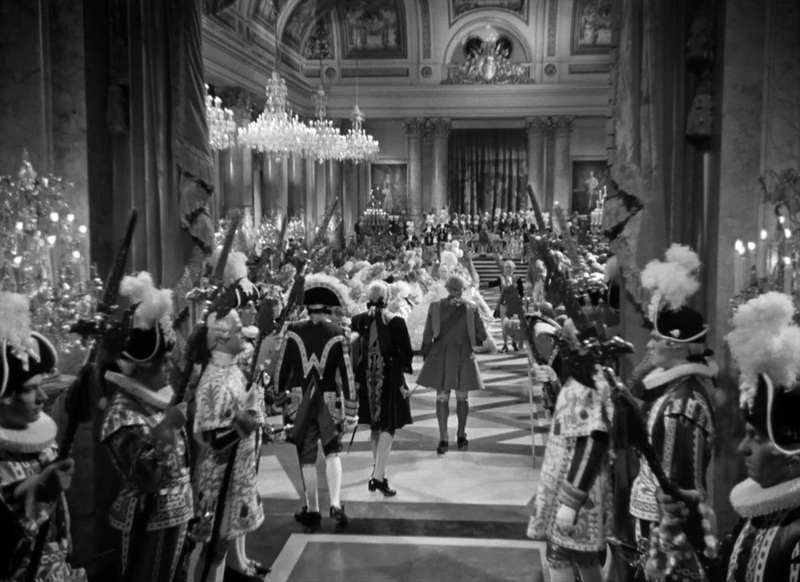 MARIE ANTOINETTE was of course based upon historic fact and, even with some opulent Hollywood flourishes was probably reasonably close to the actual events of the time, being the grass roots people power revolt in late 18th Century Paris which resulted in the downfall of the extremely unpopular Monarchy of King Louis XVI and his consort, the aforementioned Marie Antoinette - Queen of all she surveyed. 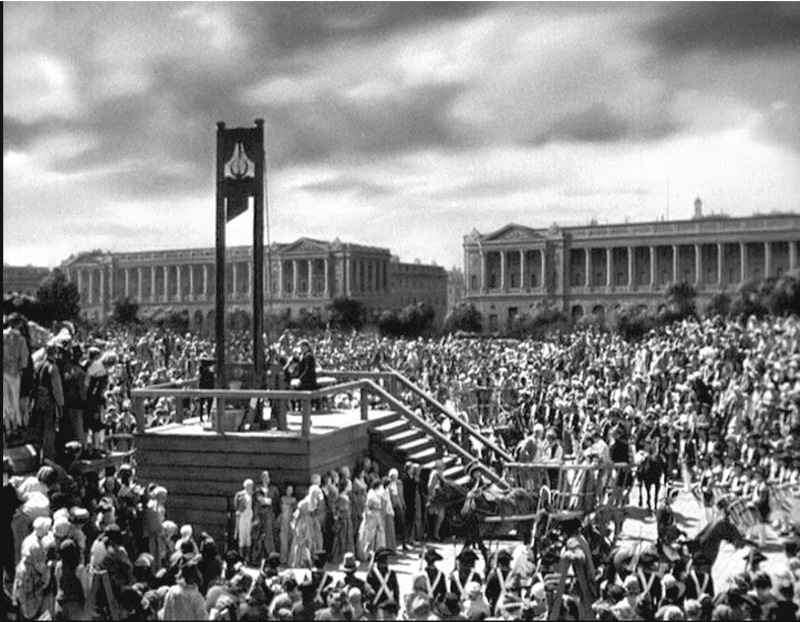 The groundswell of popular unrest would see both figures not only unceremoniously de-throwned and imprisoned, but ultimately tried and executed by way of that most French of industrial modes of dispatch, the feared guillotine. Whereas MARIE ANTOINETTE was based upon actual events, A TALE OF TWO CITIES on the other hand, although also set amid the same time frame and civil unrest and the horrors of the Reign of Terror and the storming of The Bastille which really did occur in Paris of the late 1700's, TALE was principally a fictionalised narrative dropped very successfully into an authentic segment of history by way of the pen of the great Charles Dickens. The novel takes place in both London and Paris (the two cities) published in 1859 and is still in print today. 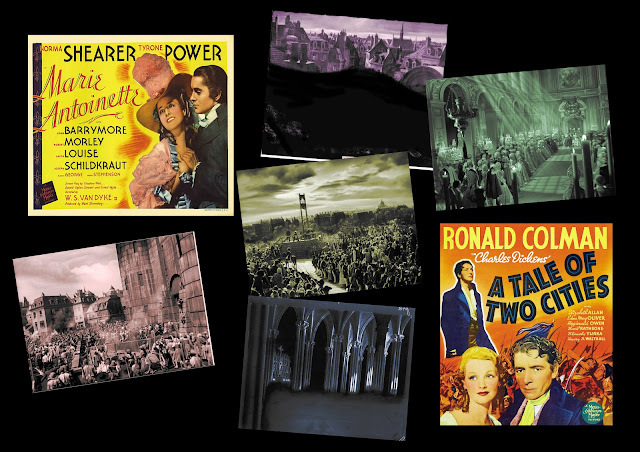 The Dicken's novel and the various seven or so cinematic adaptations, of which this 1935 Ronald Colman version is arguably the best. 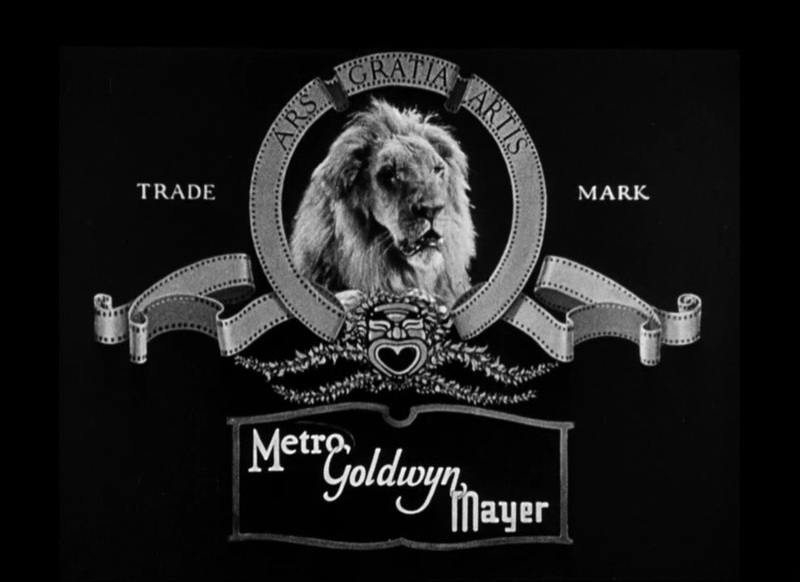 Both films were products of the extremely well resoursed and substantial studio facilities that were MGM, undoubtedly the envy of all of the other studios in Hollywood at the time and for years to come. 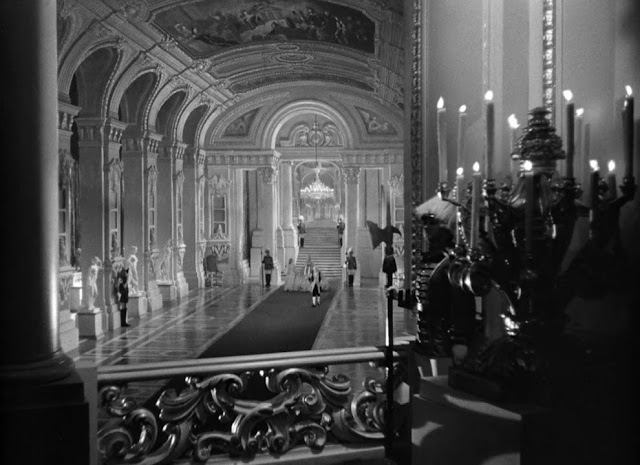 MGM were the prestige production house for grand, opulent motion pictures where it seemed, money was no object. 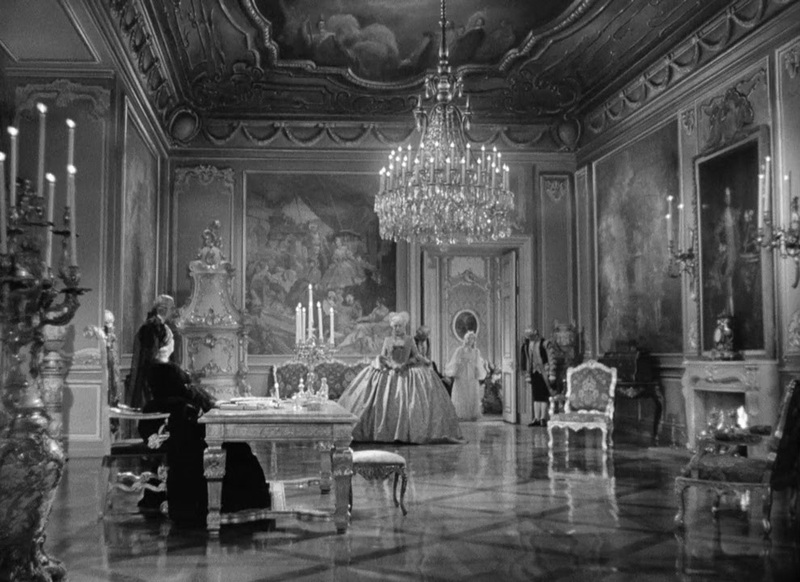 MARIE ANTOINETTE in particular was a Rolls Royce production all the way, and it looked it - beautifully photographed by William Daniels - with uncredited work by George Folsey and Leonard Smith; stunning vast sets by the legendary Cedric Gibbons and an all star cast to boot. 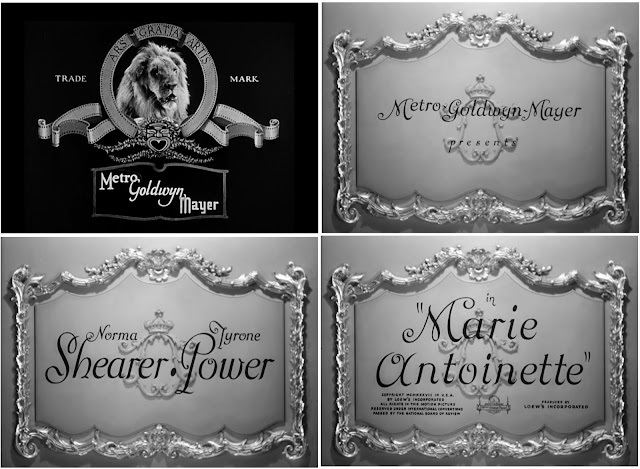 Norma Shearer, the sister of MGM's chief sound department man Douglas Shearer, looked the part as the doomed Marie, and although a little shrill at times she was generally excellent, especially in the second half of the two and three quarter hour epic. 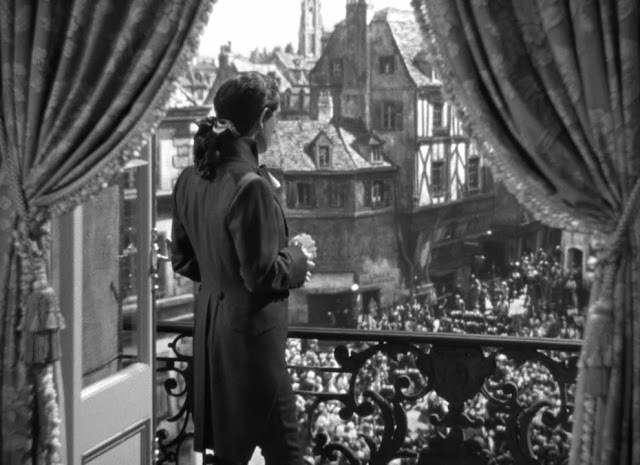 Tyrone Power is the dashing though not entirely necessary love interest, with not a lot to do. Reginald Gardiner is sensational and practically oozes venom from every pore of his skin with each scene he's in, though it really is the great Robert Morley, as the fragile and somewhat effete King Louis who absolutely steals the show hands down with a beautifully nuanced, multi layered performance which would earn him (and Norma Shearer) Oscar nominations. 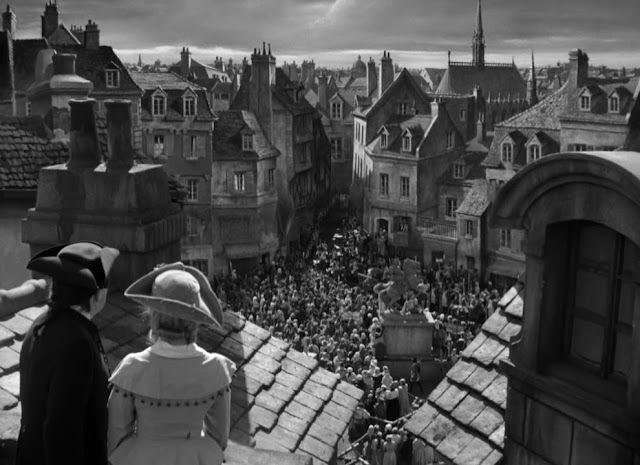 I'll discuss the background to A TALE OF TWO CITIES later on in this blog post, though much of the technical information applies to both pictures. 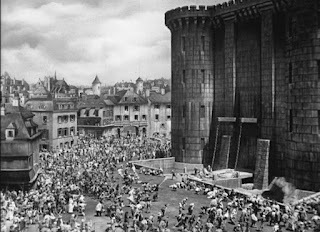 Naturally, with this being a special effects blog you are no doubt waiting to learn more about the trick work. I have nothing but the highest admiration for the special fx departments at MGM, particularly during the 1930's and 1940's which, as well as being their 'peak' era also remains my favourite era for matte work. 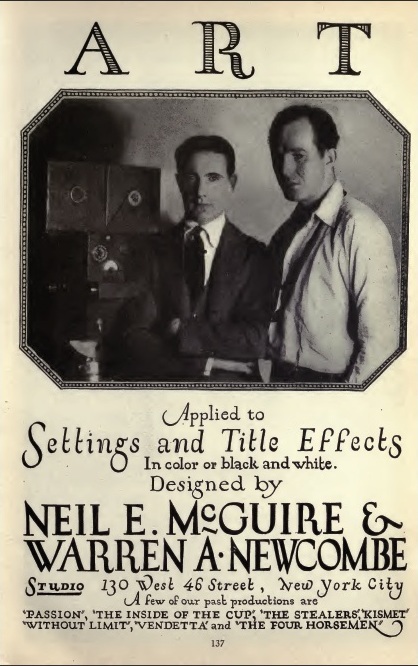 Although not credited, the effects responsibilities fell into the hands of A.Arnold 'Buddy' Gillespie and Warren Newcombe - both career trick shot technicians for Metro Goldwyn Mayer. Effects responsibilities at the studio would be divided into separate departments, with Gillespie in charge of Process, Miniatures and Physical Effects, while Newcombe controlled the large matte department under the overall umbrella of Cedric Gibbons' Art Department. A separate Optical Department was run by Irving Ries. MGM's painters. Photo from The Invisible Art by Craig Barron. Buddy Gillespie's responsibilities on MARIE ANTOINETTE were confined to two scenes with intricate miniature set ups, and some rear screen process shots - all of which look great. Warren Newcombe's matte unit however were kept very busy with many exquisitely detailed, photo real matte painted set extensions and establishing shots which even today remain breathtaking. Warren Newcombe initially began his career sometime in the 1920's on the East Coast of the United States with associate Neil McGuire specialising in glass shots, title art and silent film intertitles. 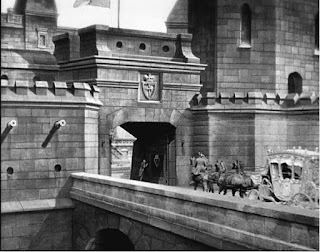 According to Newcombe's friend and matte artist Matthew Yuricich, Warren painted mattes in the 1920's for films such as AMERICA (1924) among others and came to MGM as best I can research in the early 1930's, bringing McGuire along with him as principal artist. 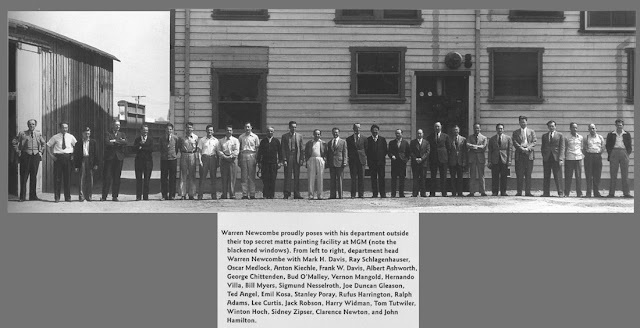 From what I've been able to glean, Newcombe gradually phased out of the actual painting of mattes and zeroed more on managing and overseeing what would arguably become the finest collection of matte exponents in the industry at MGM. 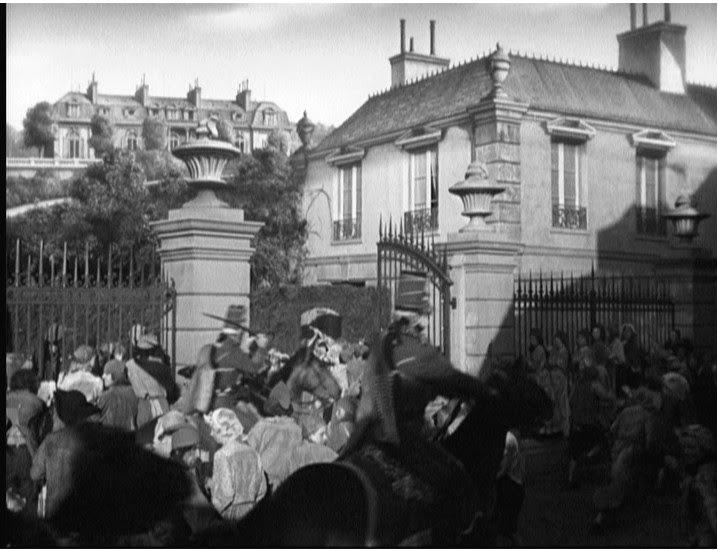 Fellow matte painters Irving Block and Lee LeBlanc backed up Yuricich's assertion that the eccentric Newcombe left all of the actual painting to others, though being head of department, received on screen credit on hundreds of pictures anyway, which was standard practice for decades. Whatever the case, Warren absolutely understood what constituted a good matte, and made sure that the vast majority of matte shots produced on his watch went out at the highest possible quality. Of all the studios it has always been the old MGM paintings that have held a special place of merit for this researcher/author. The MGM collection of matte artists were especially adept at might be termed technical illustration. 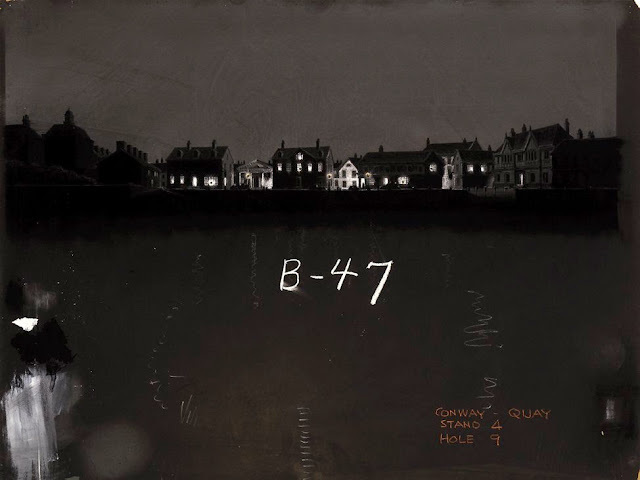 In his 2012 Oral History for NZPete's blog, MGM veteran Matt Yuricich explained the role of artist Bill Myers at the studio: "At that time Bill Myers was a draftsman who drew in most of the matte shots when I first got there, and I thought Bill did a great job. So he would mostly draw architectural stuff. He would draw the buildings and everything...all he did was to draw these things in with the lines being an indelible blue, and then you'd just fill in the spaces." Myer was an old timer who's career stretched back for decades. MGM's Newcombe matte department circa 1940 with the large roster of artists, cameramen and technical specialists. *Photo courtesy of Craig Barron's indispensable book The Invisible Art - The Legends of Movie Matte Painting. 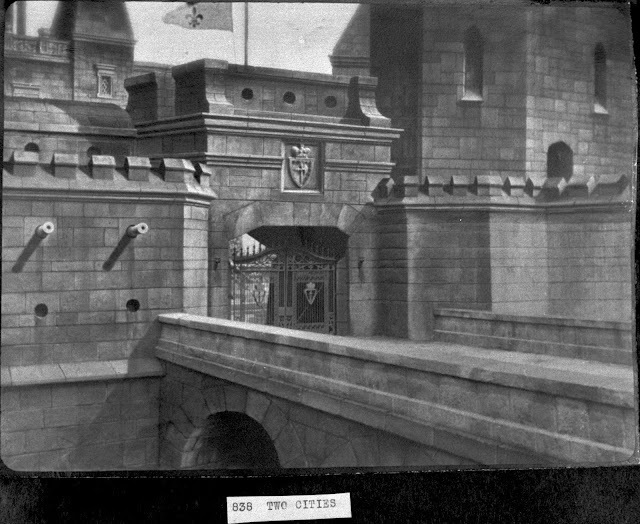 Matte artist Rufus Harrington shown here at work on an unidentifiable 1938/39 MGM film. 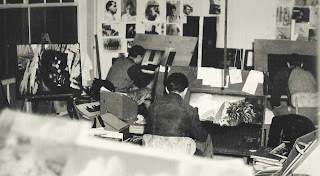 Unlike other studios the Metro artists were often architectural draftsmen and were used to preparing mattes in highly realistic fashion like a technical drawing by way of goache and very fine pastel pencils, rendering every detail upon a thick cardboard support. With many of the old MGM mattes still surviving (I have a couple) it amazes me as to how these delicate pastel crayon renderings never seemed to become smudged or defaced over the decades. 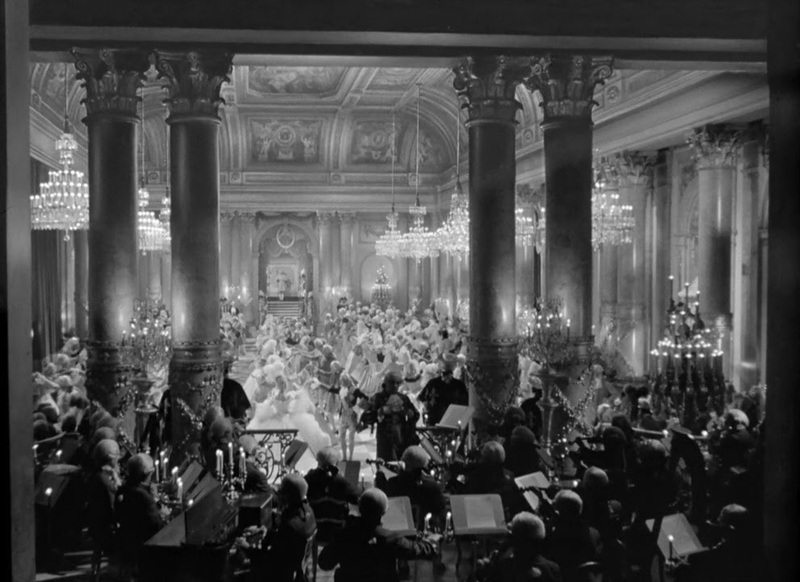 The studio gradually switched to paint as a medium, according to Matthew Yuricich, around the early 1950's with films such as SCARAMOUCHE and AN AMERICAN IN PARIS. Ahhhh, the old hand lettered titles of days gone by, painted on glass - itself an artform all of it's own. Norma Shearer looked the part and did a pretty good job in the epic length bio-pic. 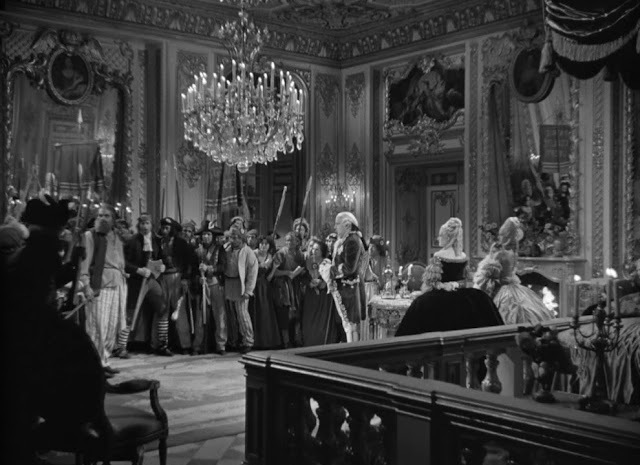 Tyrone Power (lower left) was a bit superfluous, but the rest of the cast were terrific, especially Robert Morley (top left and bottom right) as the ill fated King. 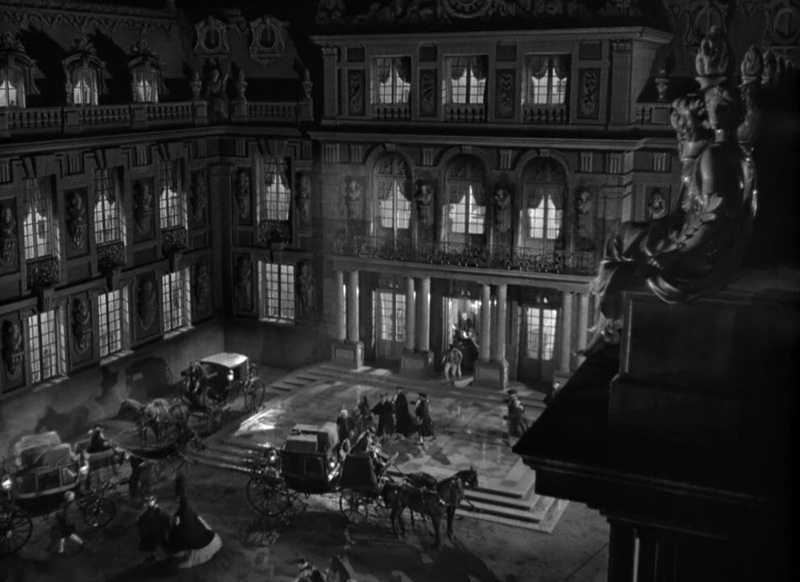 Superbly directed by veteran MGM helmsman W.S 'Woody' van Dyke, for whom this sort of grandeur was nothing new. 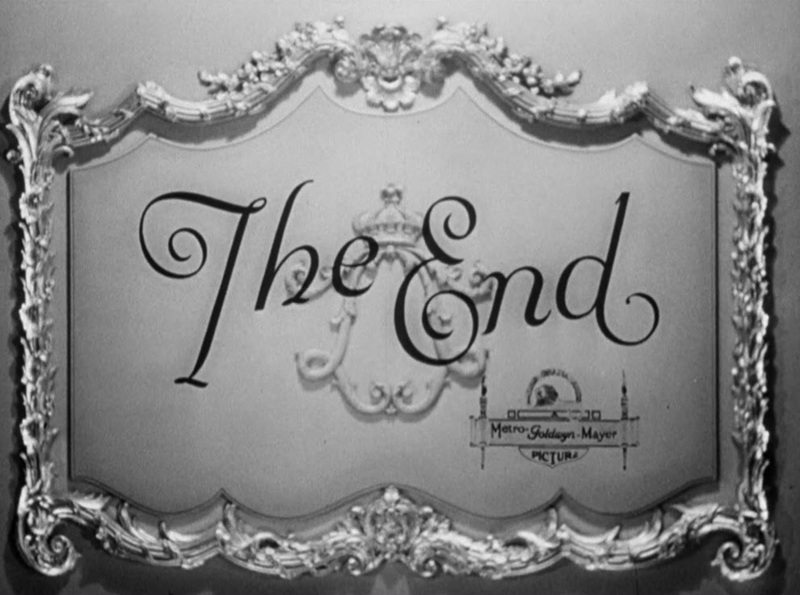 The film reputedly cost Louis B.Mayer a tad under $3million, which was a massive amount for the time. The first of many exquisite matte shots where Newcombe's artists have added on a significant portion of the set, with the upper half being all artwork. MGM seemed to favour the use of soft blends with the matte lines very rarely detectable. I don't know whether the work was done on original negative or not but the lack of grain and the excellent contrast suggests latent image work. 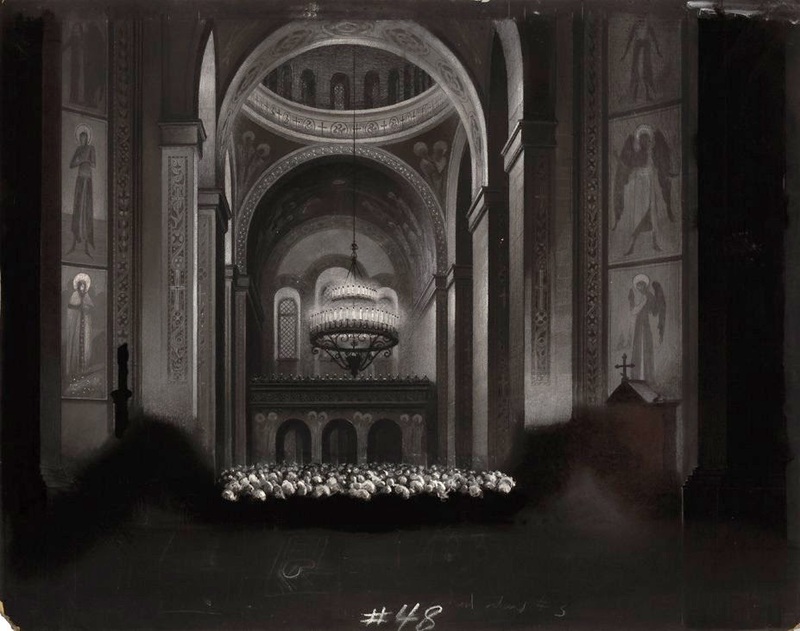 One of the most common types of matte were the 'top up' where a ceiling would be added in later partially as a matter of cost cutting in avoiding needless set construction, and partly to conceal gantries, lighting rigs and studio rigging. 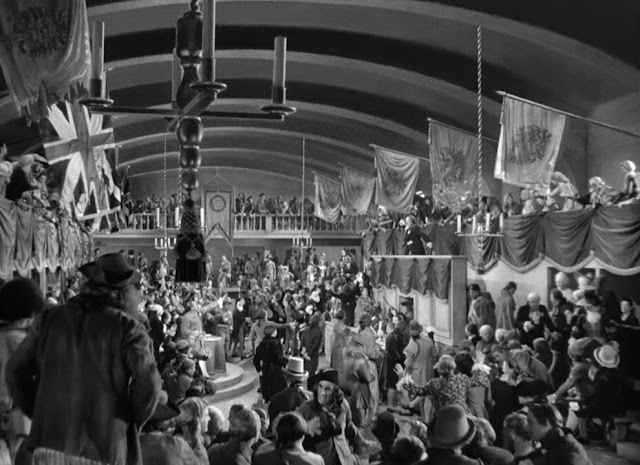 In his highly recommended memoir, The Wizard of MGM, author and veteran effects man Buddy Gillespie illustrated this shot as a miniature-live action composite with a mass of cut up pieces of cork bobbing in a large tray of water used to simulate the vast crowd of onlookers gesticulating. 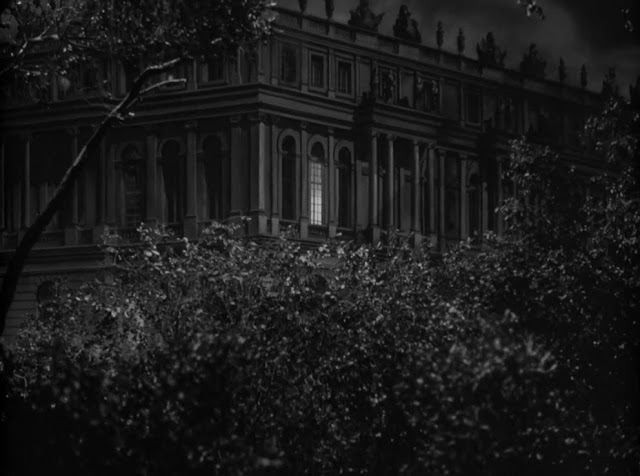 Although Gillespie didn't mention it I'm sure the palace is a matte painting or painted cutout, with the composite rear projected behind another foreground miniature set, with the washed out process being somewhat of a giveaway. 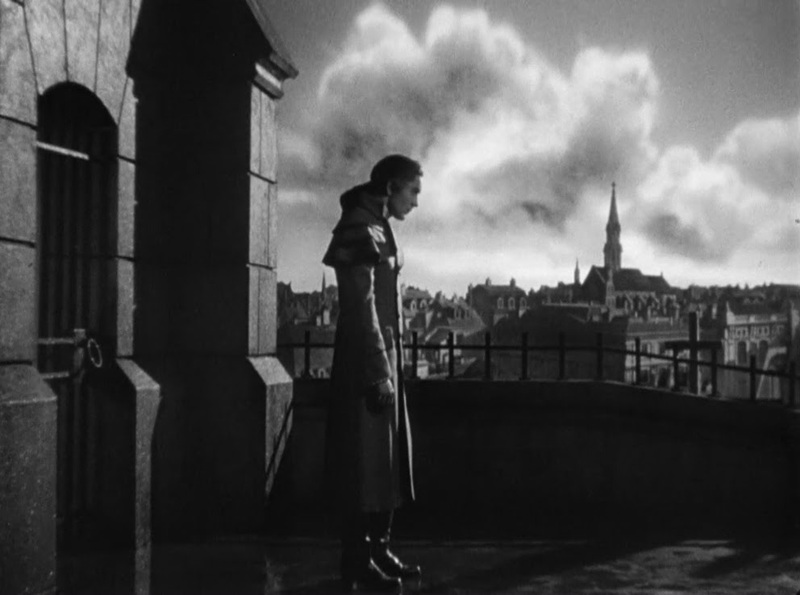 The shot would have worked a lot better I feel if the foreground had been painted in as part of the original matte rather than adding an extra 'layer' of softness and hot spot evident with rear projection. 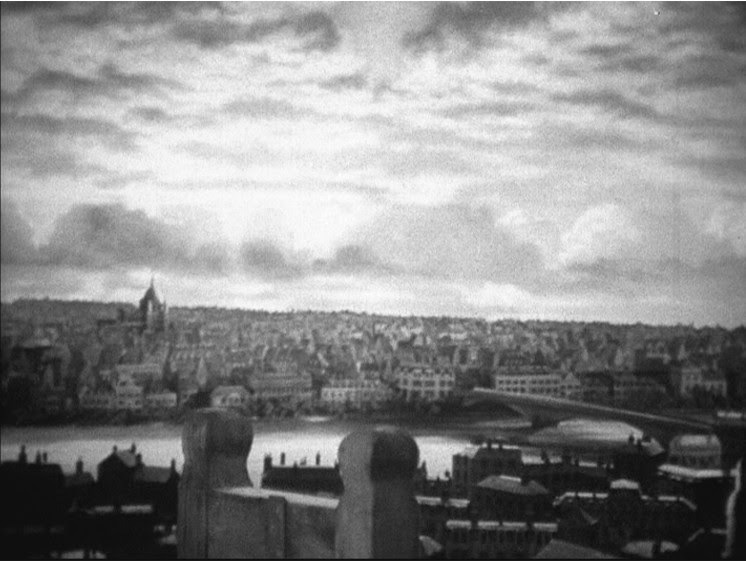 Another jaw dropping matte shot with superb blend to the live action columns, something that the Newcombe department were experts at. As already mentioned, Newcombe always dictated a soft matte rather than a hard matte line, with the soft join usually just sweeping across the frame with the artist expertly working the join to blend the two as one with fantastic results. Beautiful pastel draftsmanship. 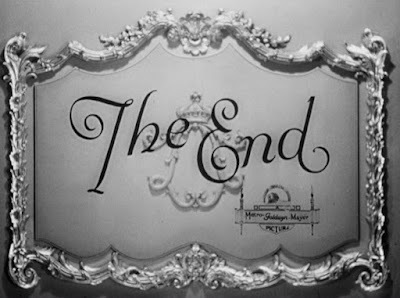 In my 2012 blog Matthew Yuricich In His Own Words,(which can be found right here) Matt explained that MGM had a highly skilled artist by the name of Bill Myers who's job it was to 'lay out' the proposed matte for the painters to work on. Apparently Myers' draftsman's skills were second to none and according to Yuricich made the matte painters job all that much easier. Not sure here...possibly a genuine production shot ... or may have had that wonderfully deliberately distorted columnal perspective added in later? Whatever, it looks cool. Before and after where we can see the soundstage rigging and lighting fixtures prior to the addition of the artwork. 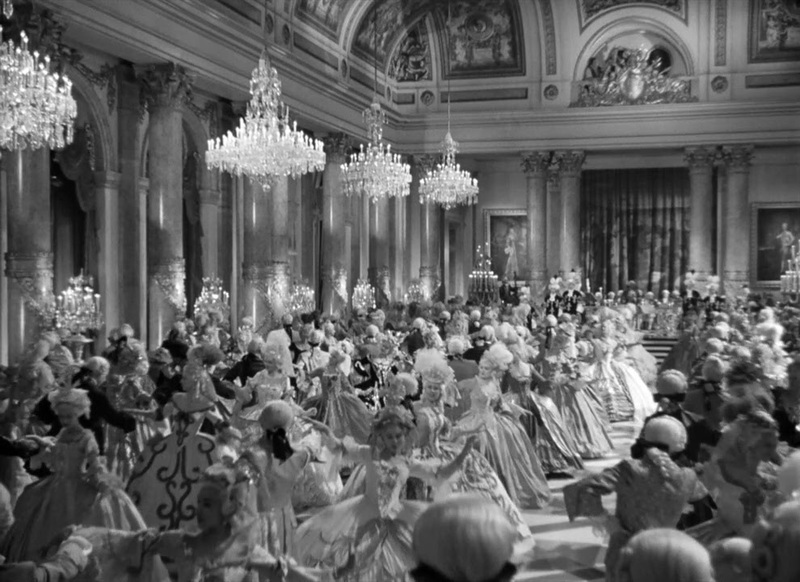 Elegance was for decades the by-word at MGM. They may not have had the grittiness of Warners, the morbid horrors of Universal nor the comedic output of Paramount, but they did have elegance by the truckload. ...and the flawless finished scene. For several sequences, MARIE ANTOINETTE is wall to wall matte shots. I don't know of any other matte departments where media other than oil paint was the method of choice. Matt Yuricich started at Metro after the pastel era when it was all pretty much being done in paints and explained: "We tried pastels later but found they were so soft we just lost the entire composition. Early on, somebody at MGM wanted to do them all in pastel crayons, with all of the mattes done in pastels. They felt that blending was easier when working with pastels. I still have the pastel pencils somewhere...white carbon pencils...you just can't get them anywhere that good. Sharpened, they were needlepoint sharp...they had black and white pencils but mostly white. They were the greatest pastel pencils in the world, though the others today look like they have glycerine in them or something. They weren't using them anymore when I was at MGM and I'd take home boxes of them because I used them at home for laying in drawing detail over my painting when it was dry." Not sure on this one. The ceiling and tops of the flags sure look painted but that foreground suspended fixture has me baffled? Most likely a rear projected plate of a Newcombe artists' painting of Paris. Possibly a miniature or cut out profile with foliage arranged in foreground to allow dolly in. "Let them eat cake"... The jig is most definitely up. Upper wall, cornices and ceiling painted in. Matt Yuricich said it wasn't unusual for the artist to jokingly draw in weird, rude things like dogs screwing etc into detail such as this. Lee LeBlanc did it apparently and so did Howard Fisher at times! 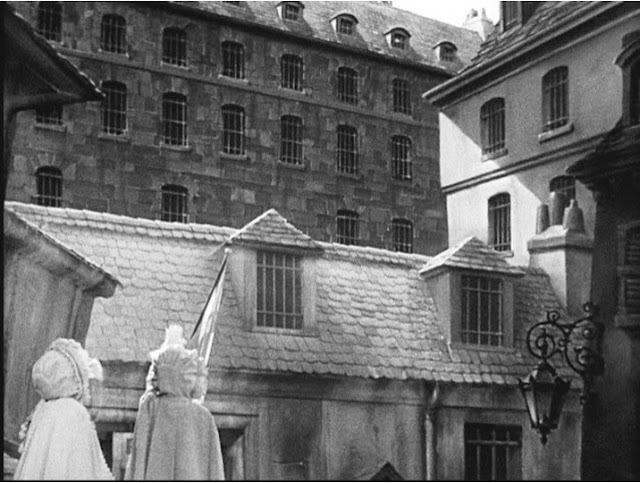 Small exterior set on the MGM backlot enhanced with matte art. 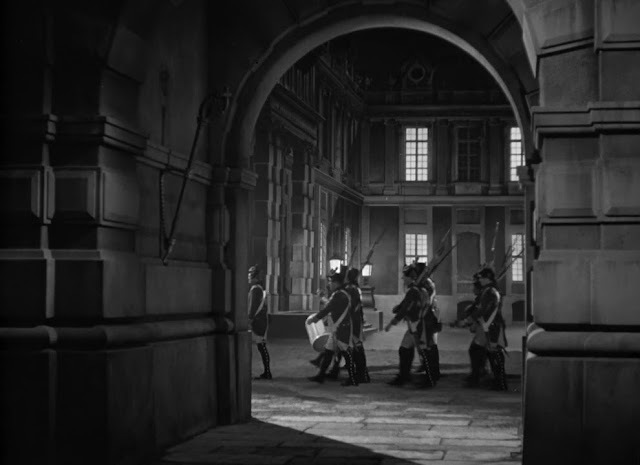 May be a matte split screen or possibly a very good scenic backing behind the soldiers? Matte art composited in just above the top of the carriage and below the rooftop edge of the houses. 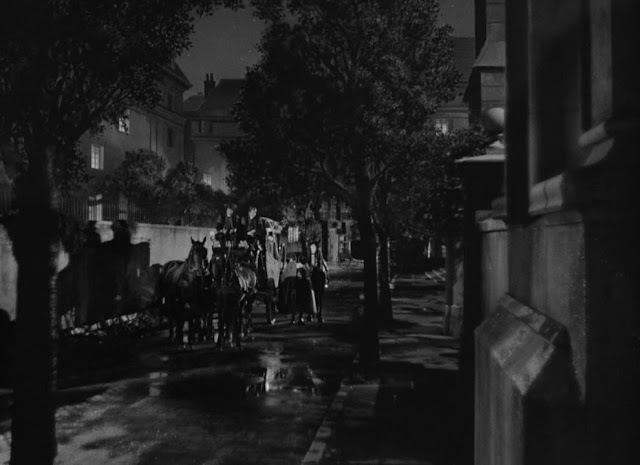 The foreground tree is likely a separate live element bi-packed in over the shot, a common realistic touch carried out at MGM, Selznick and especially Fox studios at the time. 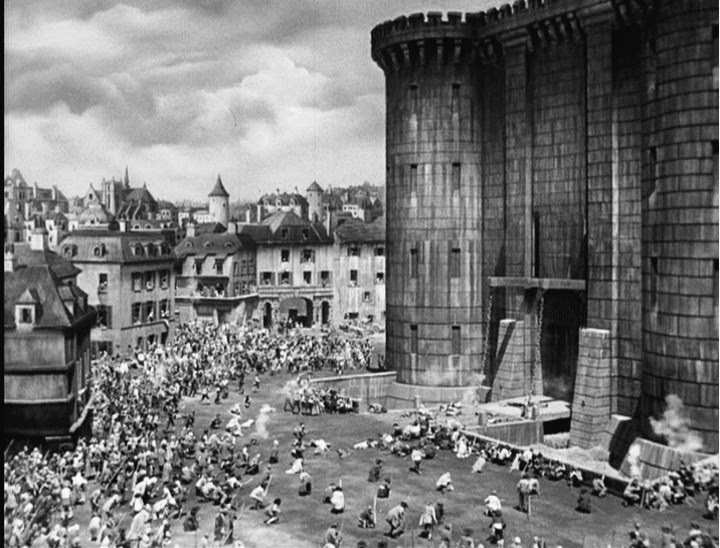 A three way effect here; matte painted city is split screened with live action crowd on the backlot, with this in turn being the plate as a rear projection process shot behind Tyrone Power. It was quite common at MGM for Newcombe to have one of his artists paint a relatively small scene primarily for use as a process plate background. 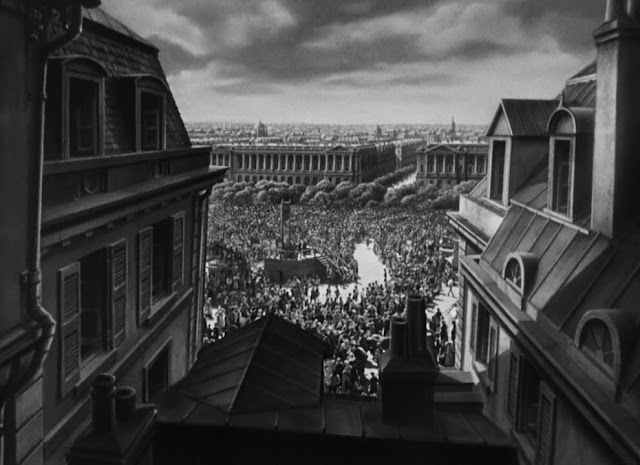 My favourite matte shot in the movie is this spectacularly convincing sweeping vista of 18th Century Paris. One cannot help but be impressed by Warren Newcombe's quality control with the department's output. The much derided and generally despised Marie is lead up the steps to her execution with not a pitying soul to be found anywhere. 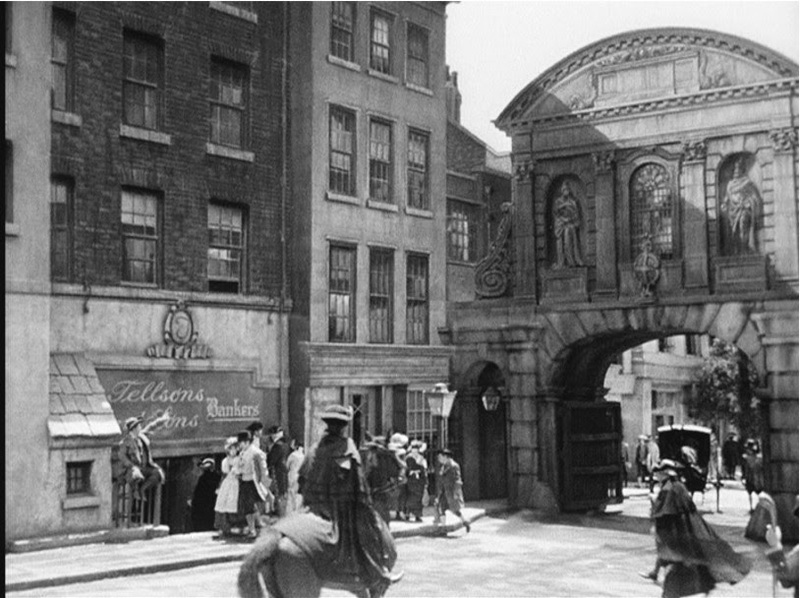 However, not all is how it might seem folks... that's actually Ronald Colman being lead up the steps to the guillotine there as this entire shot was pinched from the earlier A TALE OF TWO CITIES made three years earlier. 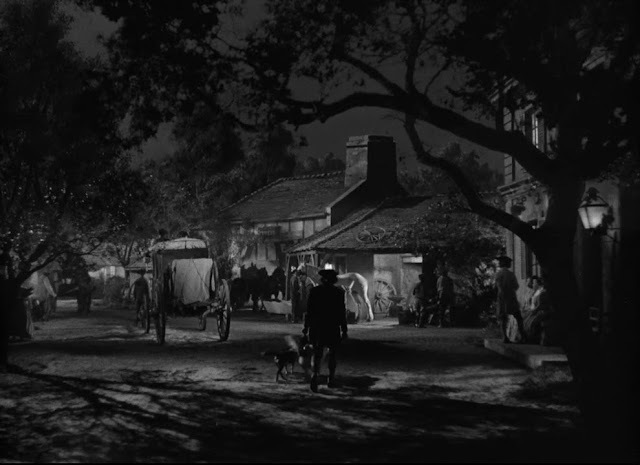 Terrific matte art though no matter which way one looks at it. Star Ronald Colman with director Jack Conway. 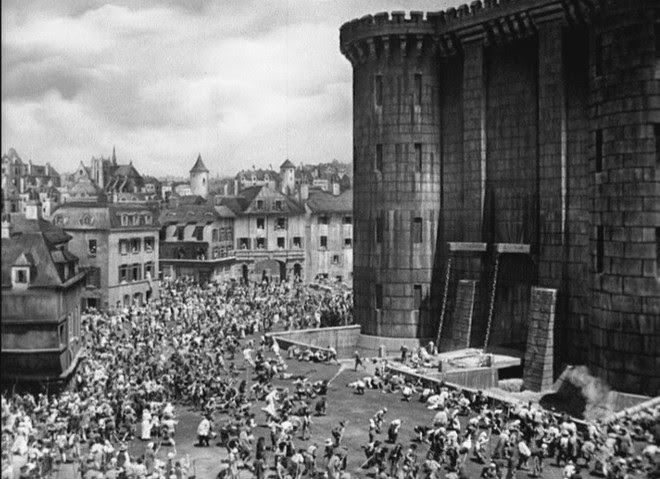 On a similar trend we have A TALE OF TWO CITIES which was made in 1935. 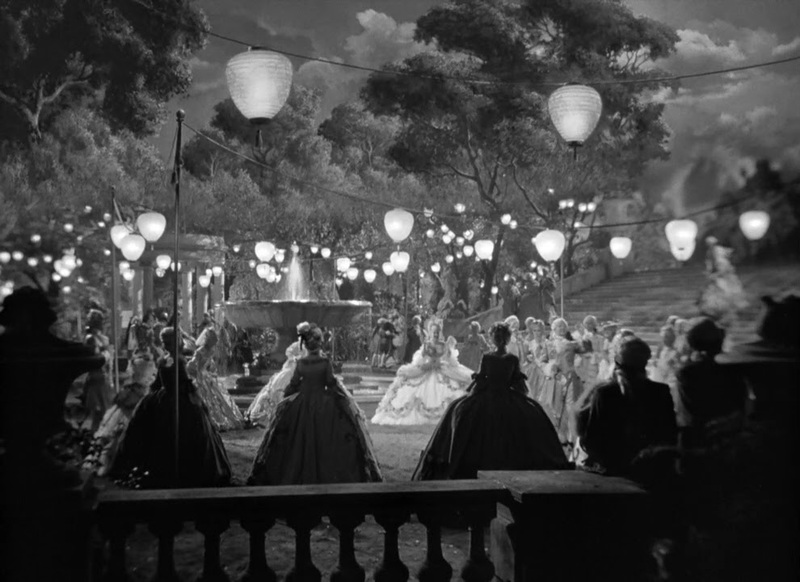 David O. Selznick produced this one while still at MGM before moving on and starting up his own studio. 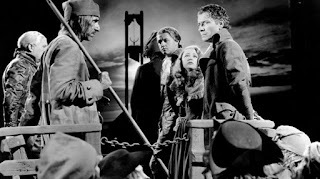 Based upon the wonderful Charles Dicken's novel by the same name - an epic tale of love, sacrifice, turmoil and revolution - the film is but one of at least seven different cinematic incarnations, with at least three of those being silent versions. Ronald Colman was always a fine actor and never better than here as English lawyer Sydney Carton, caught up in Paris in the madness that was the infamous Reign of Terror of the late 1700's. An emotional, gripping, heart wrenching rollercoaster by the time the last reel unspools, A TALE OF TWO CITIES remains the definitive classic and simply hasn't dated. A masterpiece! The production is first rate though not as 'glittering' perhaps as MARIE ANTOINETTE, with TALE having a somewhat darker edge to it out of necessity. 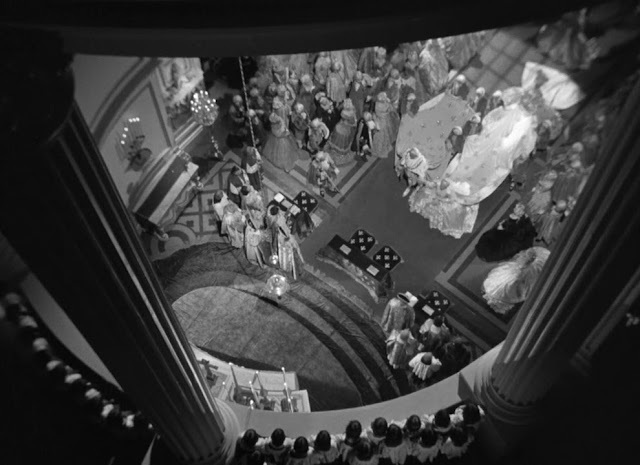 Far less need here for the gauzy soft focus modelled lighting upon the female lead as was deemed important for the former film. Cedric Gibbons was Production Designer and although the picture had no credits for special effects it's most likely that James Basevi was in charge here. 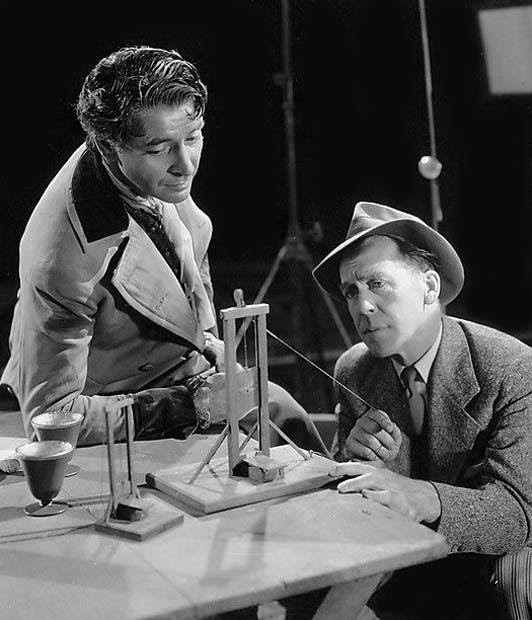 British born Basevi was hired by Cedric Gibbons in the late 1920's initially as an art director and then to head up the studio's special effects department, a position he would hold until the late 1930's overseeing the visual effects work on big films such as TARZAN THE APE MAN and SAN FRANCISCO. 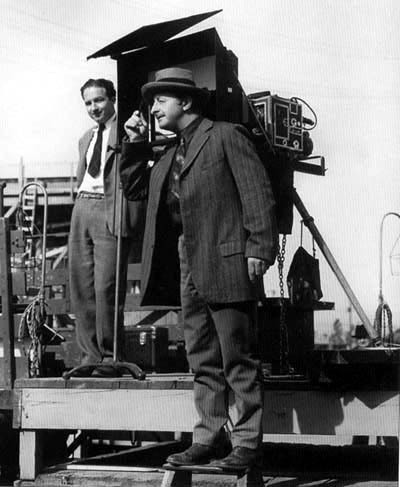 James would depart MGM in 1937 for Samuel Goldwyn Studios and then United Artists where he would supervise the effects on films such as HURRICANE. Basevi was assisted by a young Buddy Gillespie who would take over the department upon James' departure and continue on with astonishing levels of success for the next 28 years. 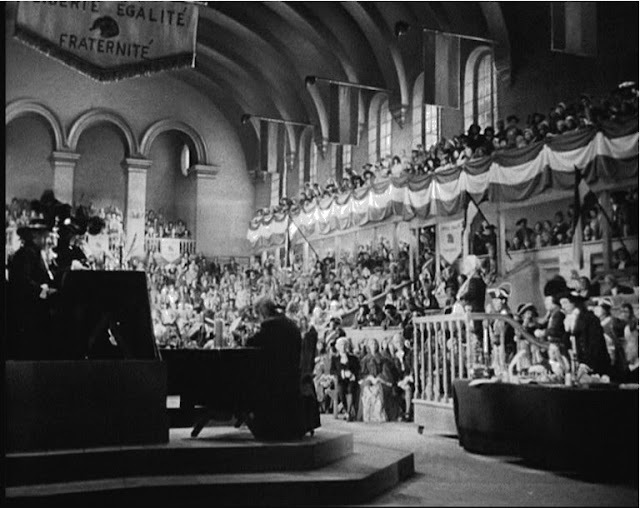 Visual effects cinematographer Mark Davis composited all of the matte shots on this, and many other MGM pictures, with a lengthy career with the studio that included some 470 feature films as well as numerous tv shows. 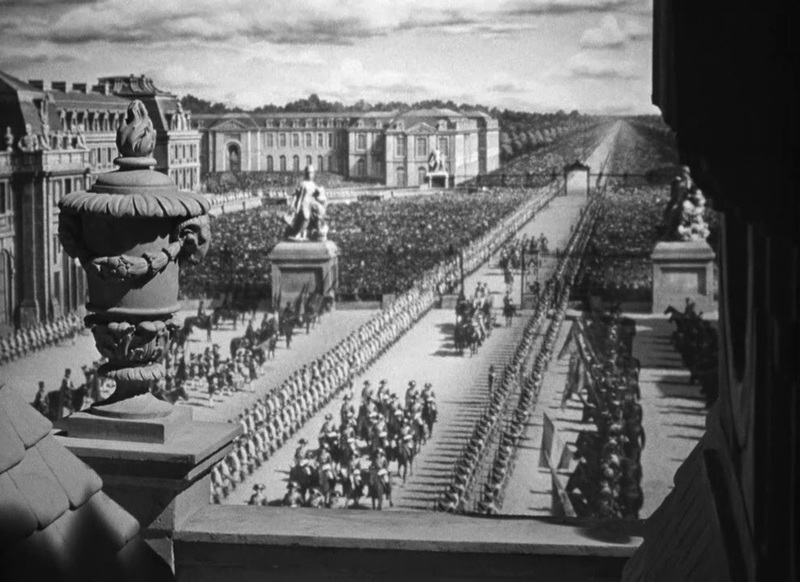 Mark is reputed to have assembled some 3000 matte shots in his career! According to author Rolf Giesen, Davis was also an expert matte painter in his own right. 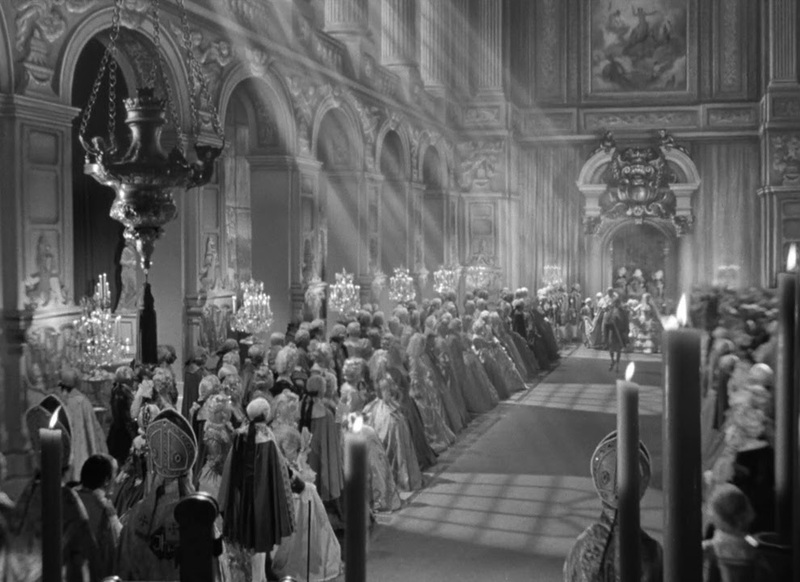 Matthew Yuricich said that Mark was particularly good at effects gags such as those wonderful twinkling neons and animated bulbs sen so many times on matte painted theatre marquees in all of those Metro Technicolor musicals over the years. Interestingly, imdb credit the esteemed and highly regarded British matte exponent Walter Percy 'Pop' Day as matte artist on this film, though I find that quite improbable and completely impractical. Similarly, Day has been 'credited' (rightly or wrongly) for other Hollywood features such as RKO's HUNCHBACK OF NOTRE DAME and Fox's HOW GREEN WAS MY VALLEY which I'm sure is inaccurate. I'm not sure how this came about. The opening matte shot is this perfectly rendered pastel 'painting'. Being rather small in dimensions, the MGM mattes were executed on tilt down draftsman's tables rather than on studio easels as elsewhere, with the Metro artists seated close to the piece rather than standing and applying paint with a long handled brush. 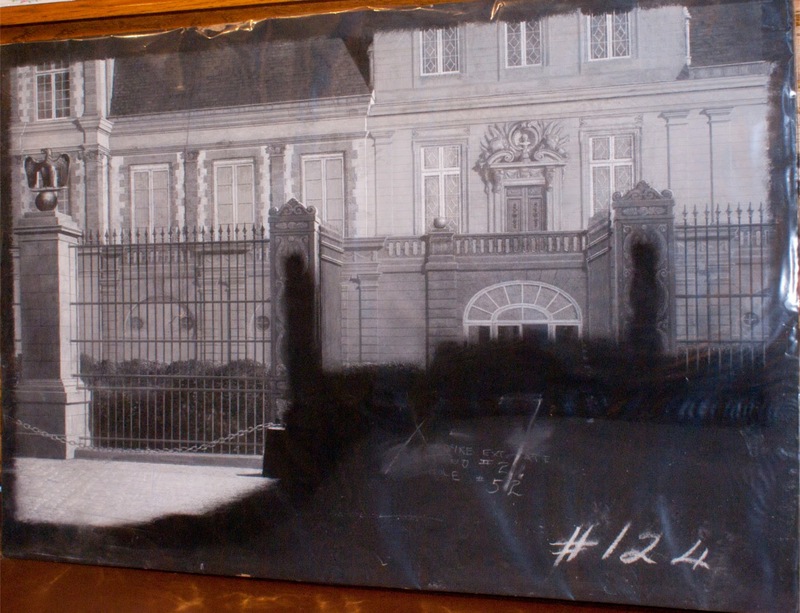 Almost all were rendered on heavy duty card or in some cases hardboard (or masonite as they call it in America). 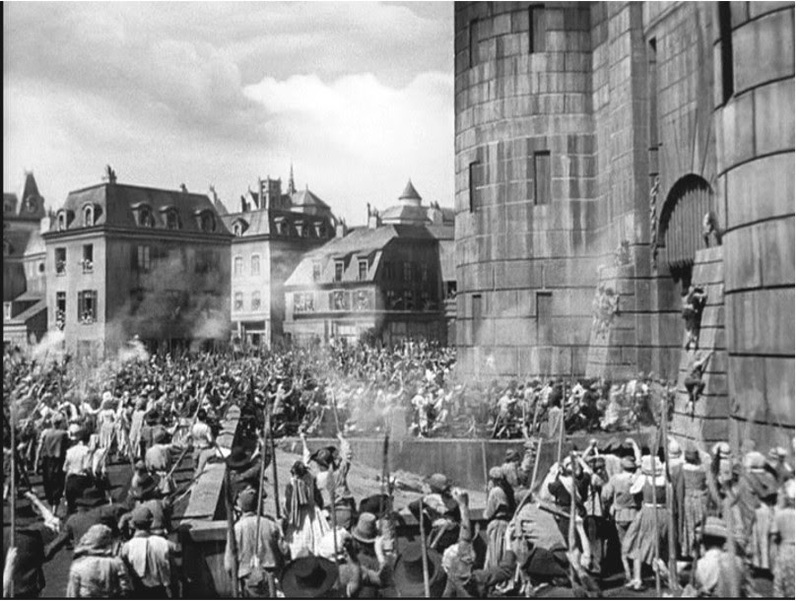 The peasants are revolting (some might even say disgusting?) 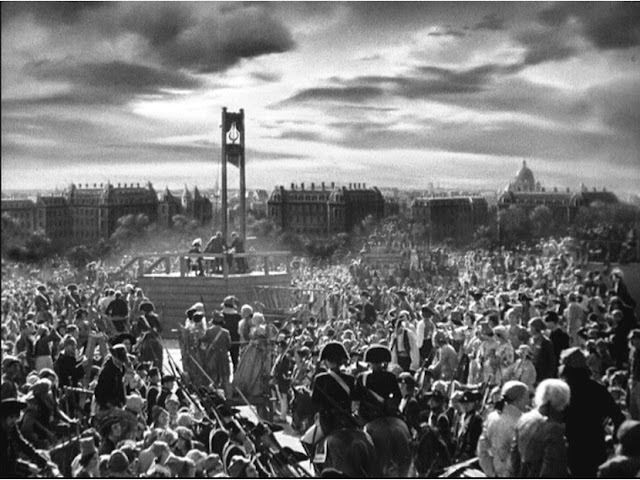 - The storming of The Bastille, and not a moment too soon. 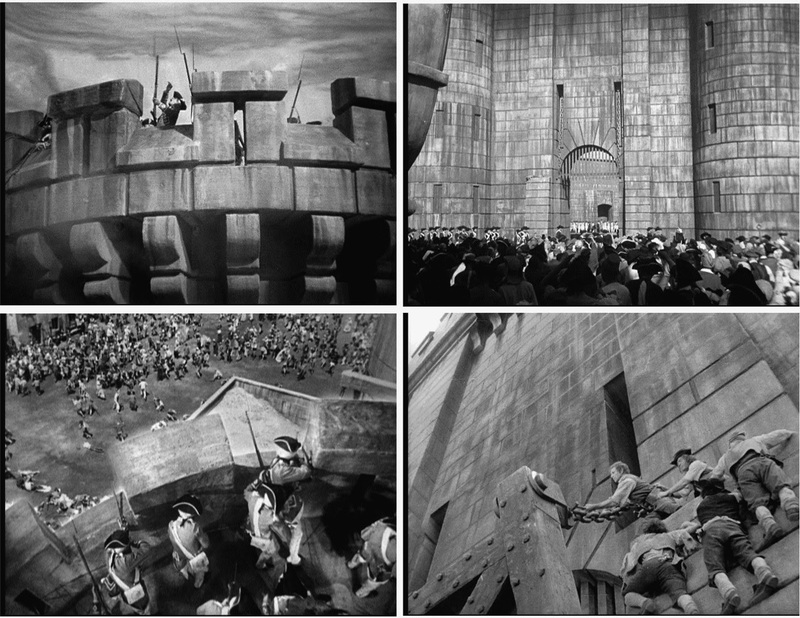 Top left probably a real set; top right matted extension; lower left is a composite shot with soldiers on the battlements being inside a sound stage and the crowd below being a separate element photographed on the backlot. Lower right, I'm not sure here but suspect that most of that vast wall might be a matte painting. The revolution gains momentum though it becomes quite clear fairly soon that the whole gig gets somewhat out of control. More pastel artistry that matches up to the live action so well one could easily miss the trick. This picture was actually the fourth version to be made, with at least another two to come later on. The J.Arthur Rank version in the late 1950's with Dirk Bogarde was quite good, though quite poor as far as the matte work went. A grand interior courtesy of Newcombe's matte artists. 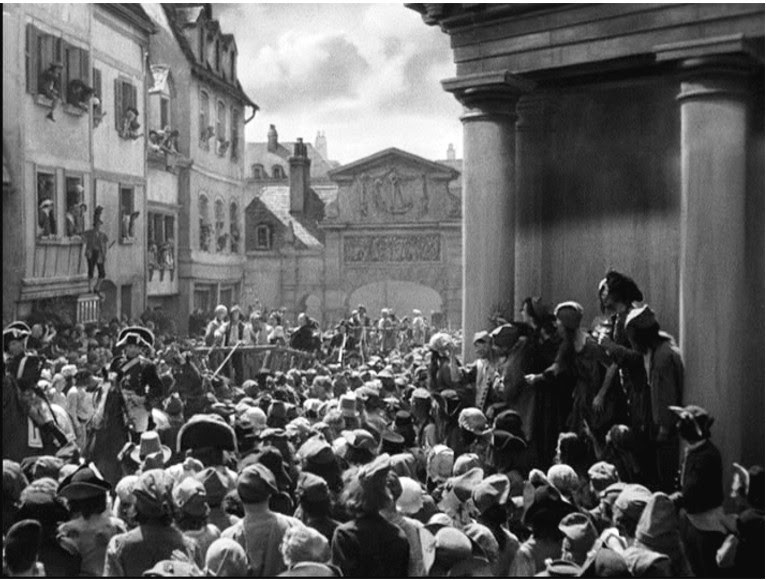 These mattes were auctioned off a year or two back from a major dealer, and are purportedly from A TALE OF TWO CITIES, though I couldn't spot these scenes in the film, so perhaps the shots were dropped at the last minute which is not entirely unheard of. 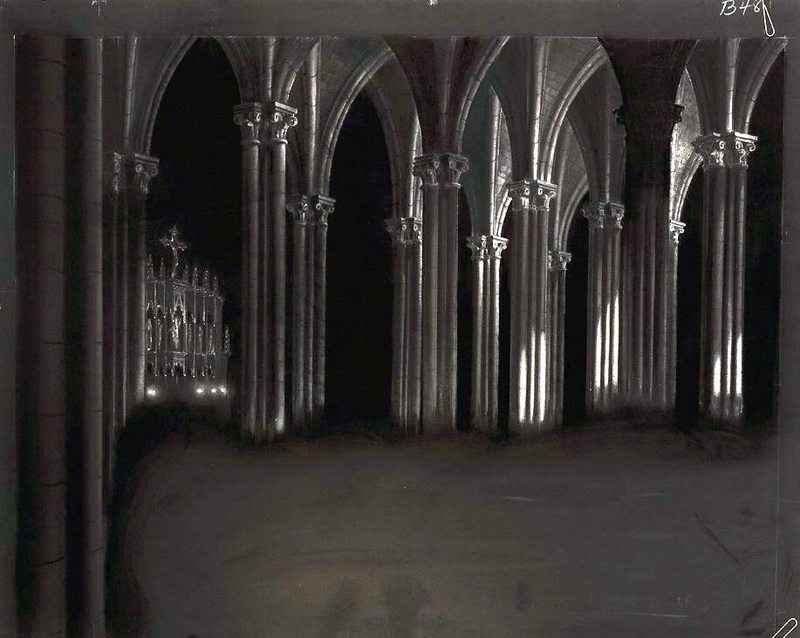 I've seen a number of MGM pictures over the years where I know mattes were painted for them, yet the scenes have apparently been either dropped or cut in such a way as to eliminate the matte, even though much work had obviously gone into the preparation. 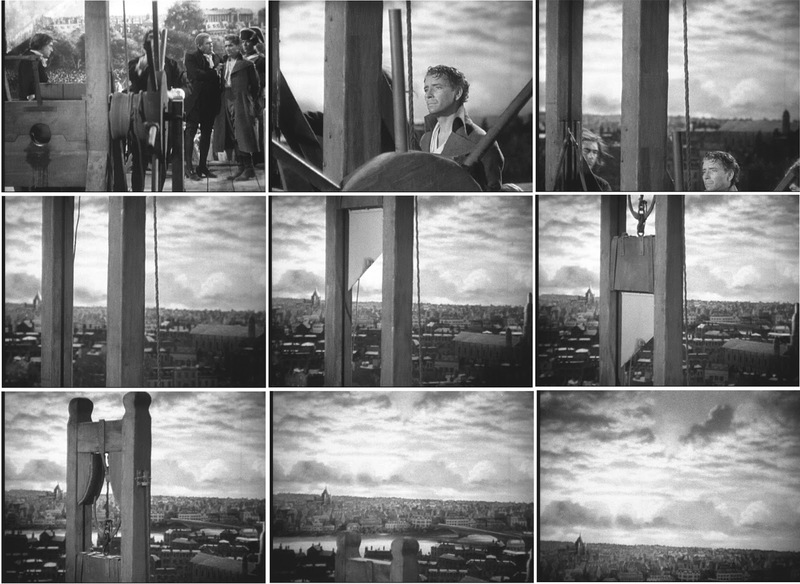 I've seen evidence where two, three or even more mattes might be painted and finished for a given scene, with slight differences in each, with just one (or none at all) utilised in the end. It appears that MGM could afford to give their directors broad freedom of choice. 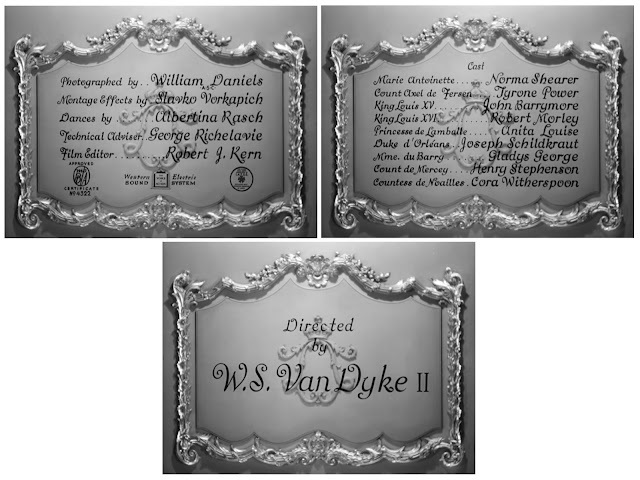 I'd have to take another closer look at the DVD to try and spot this one as it does appear to be intended for the film as director Jack Conway's name is inscribed on the matte. I don't recall this scene being in the film. 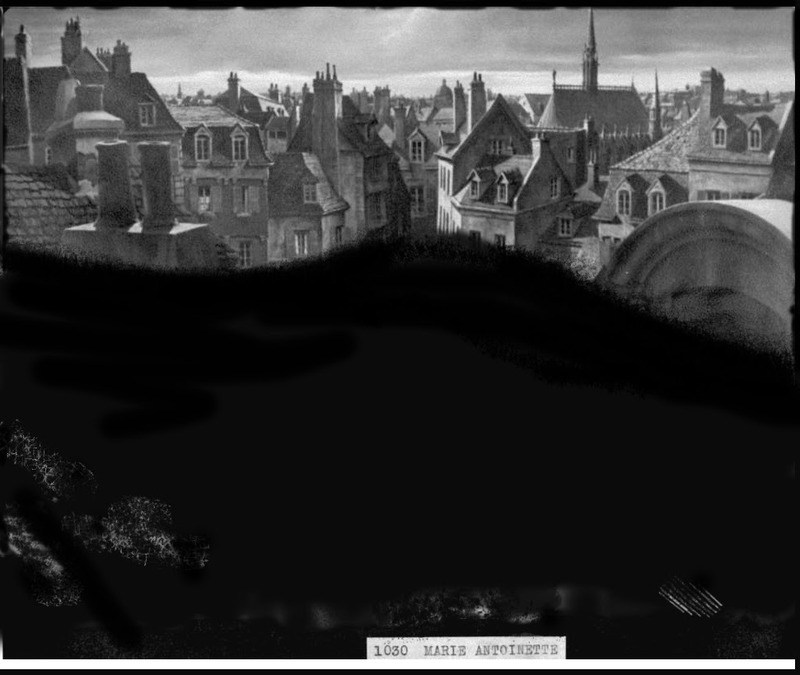 Likewise with this matte art. 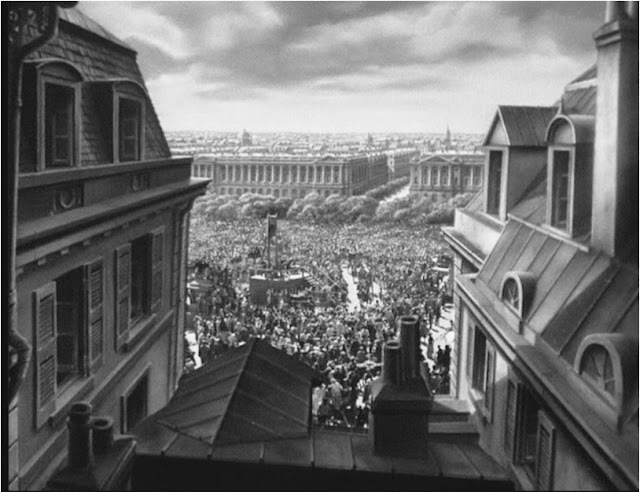 All Parisians were created equal....though some were created more equal than others. 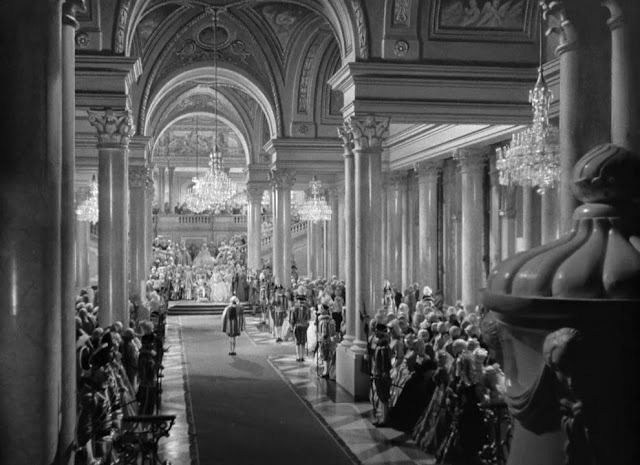 The shot that was also recycled 3 years later for MARIE ANTOINETTE. My favourite matte in the whole film and one of the most stirring mattes - not to mention scenes - ever! A tighter shot from the reverse angle. "Yeah....I'd like you to take just a little off the sides, and can you give me one of those, you know that Justin Bieber look?" A really impressive effects shot actually, involving live action, matte art and process, complete with a wild camera move skyward as the blade falls.